The true charm of a Christmas wedding is, without any doubt, snow. Ask your wedding photographer to make the most of it by using a snowy setting to enhance the beauty of your wedding rings, your snow-white wedding dress, and your fabulous wedding bouquet. 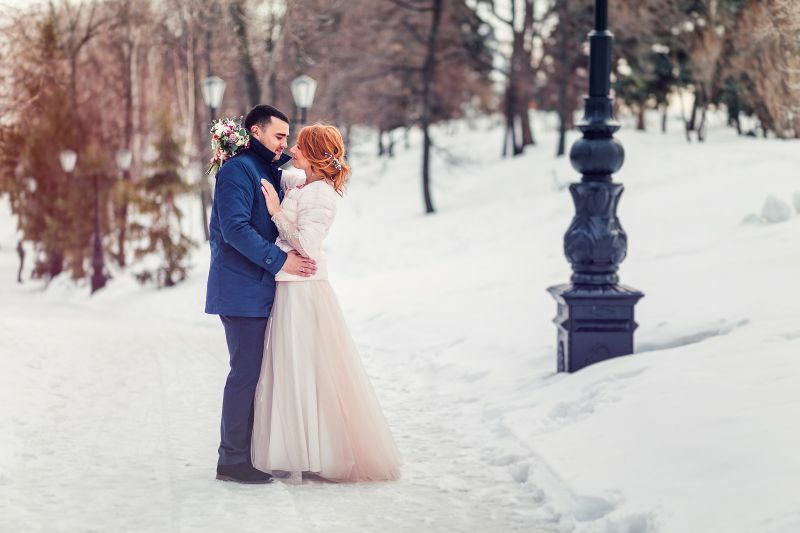 Don’t be afraid of the cold and the snow outside and your wedding photographer will reward you with a winter wedding photo session you haven’t even dreamt about. What is a Christmas wedding without traditional Christmas lights, a Christmas tree with beautiful ornaments, and a classical pine wreath? Using Christmas lights for decorating the reception venue will result in lovely Christmas-themed photos of you and your wedding guests. A generously-decorated Christmas tree, on the other hand, makes the perfect Christmas wedding backdrop! Incorporate this romantic holiday tradition into your wedding by setting the stage in which the groom steals a kiss from you because he just caught you standing under the mistletoe. Your wedding photographer will certainly find a creative perspective to include this blossoming symbol of love in capturing your wedding rings’ blink as well! If you have set your eyes (and heart) on a Christmas wedding, you will certainly want to match this winter wedding theme to the traditional Christmas colors, red and green. The good news is that they beautifully correspond with each other and make the perfect pop of festive color for your wedding dress, wedding bouquet, reception décor, and wedding cake. Your wedding photographer will not be able to thank you enough for giving him the opportunity to capture the beauty of winter and Christmas on your most special day! What is Christmas without presents? Your wedding presents are already wrapped up in adorable packages, waiting to be opened by the happy couple. Stick to the Christmas wedding theme by placing your wedding presents under the Christmas tree and ask your wedding photographer for a few pictures of you and the groom opening Christmas wedding presents. Involve your loyal winter crew (known as your bridesmaids and groomsmen) in an improvised snowball fight. Is there a better setting for the ultimate bridal party fun? Your wedding photographer will not miss the opportunity to capture all the fun on camera and the results will be totally worth everybody’s frozen hands. Hint: Arrange steaming hot chocolate to be waiting inside for everyone to warm their hands with after the snowball fight is over!